Summary: A short week for us as we took almost 2 days off for Christmas with our friends on s/v Vamp, but the guys (mostly Muslim) worked all week. Baw masked most of the foredeck and sprayed Thai gelcoat over many areas, to make sure surfaces were appropriately finished. Houa made excellent progress, finishing several floor supports and the top step to the starboard hull and most of the headliners for the bathrooms. Jon seemed to spend most of the week on the scooter, running errands and shopping for boat bits. 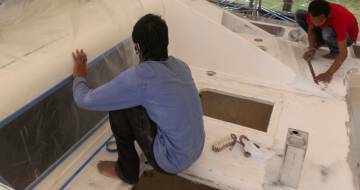 We got 2 new workers - Jack worked under Ocelot, finishing the top of the bimini and also sanding many small bits - hatches, access panels, louvers and such. Yoong finished filling and sanding the targa bar to prepare it for gelcoating next week and moved on to the cockpit. Baw and Lek wet‑sanded the port sugar‑scoop to a nice shape and finish. Chai continued with the starboard sugar‑scoop. He's a little behind Baw so has to match Baw's shape. Nut and Bank spent most of their time sanding the fiddly bits on the main cabin. Sue played Project Manager, carefully running herd on all the action. Max visited and was awarded one of our new Ocelot Refit Team T‑shirts. A day of preparation and masking. Baw wants to spray gelcoat on some of the nominally finished areas. By polishing them up, he can see if they're truly finished or if they need more work. So the guys were masking the deck with tape and plastic. Baw himself was trying to lay out where the antiskid was going to go so that he wouldn't spray those areas. With language difficulties it was hard to get across our ideas of how we wanted him to spray minimal areas, not the whole top of the cabin and deck. With a heavy rain squall midday there was no chance of his spraying today, so he concentrated on getting areas ready. Bank, Nut and Lek all worked with Baw to prep the decks. They got new plastic sheeting taped over the windows and over the open hatch areas on deck that would be near the spraying. Chai continued his magic on the starboard sugar‑scoop area. We're not sure it's the same "fatness" as port, but we'll be checking it again. Sue supervised the deck work, trying to oversee things and find places that still need work. Jon ran some boat errands (love having Scooter!) to get some last minute "gotta‑haves." Amanda didn't get to the yard today as she was finishing up Christmas presents back at her apartment. What's Christmas without a few hand‑made gifts? Shhhhhh. Surprise, surprise. 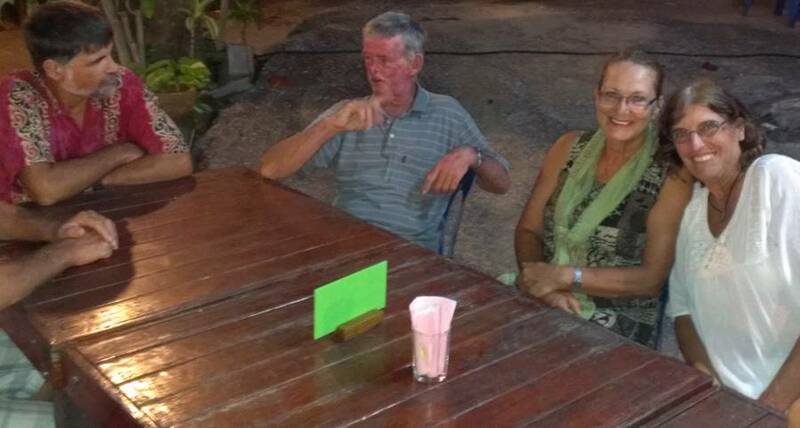 Jon and Sue left at noon to pack, and together with Amanda went to meet our friends on Vamp at the marina. We're off to spend a couple nights on the water and to have a special Christmas Eve dinner ashore! Yay! Merry Christmas to all! It was a beautiful clear Thailand northeast monsoon day. We awoke on the blue waters of Nai Harn Bay, western Phuket, aboard the beautiful sailboat Vamp. We shared a wonderful Chrsitmas day with cruising friends, ate too much, laughed a lot, swam in the ocean, and basically had a great day off from Ocelot! We didn't get to the yard at all today, but we knew they would be spraying gelcoat on areas of the deck. We were happy to see the blue skies all day! Boxing Day, and we recalled the tragedy of Boxing Day 2004 when this coast of Thailand, and so much of Myanmar, Malaysia, Indonesia and coastlines farther west were so devastated by the earthquake off the top of Sumatra and the subsequent tsunami. We awoke once again to the cool, fresh breeze over the water at Nai Harn Bay aboard Vamp. After a quick breakfast of chocolate croissants, fresh pineapple, mango, and hot tea and we were dropped ashore to catch a "songtau" (small open pickup truck bus) back to Chalong so we could get to the yard before lunch. We arrived to find our dream of a white sailboat for Christmas to be partially true! Baw did in fact spray on 15 liters of white gelcoat yesterday and the men were hard at work sanding it to bring up a semi‑glossy finish. When gelcoat is fine sanded (above 800 grit) or wet sanded with a coarser grit paper, it gets a fine sheen. This really lets you see the curves, or more accurately, any dips or bumps in the lines and decks. Baw sort of led the team of Lek, Nut and Bank as they made the rounds of the newly sprayed areas up on the deck. We were especially happy to see that the first efforts had gone into the parts of Ocelot that were rebuilt, and therefore most vulnerable to shaky lines or indents in the finish. As far as we could tell, the spine on the cabin top and the rims of the deck hatches on the cabin top all look great. Ditto for the side coaming down by the deck. But more sanding will reveal all! Any dips or lumps can be easily sanded out or lightly filled with more gelcoat filler before the final spraying. 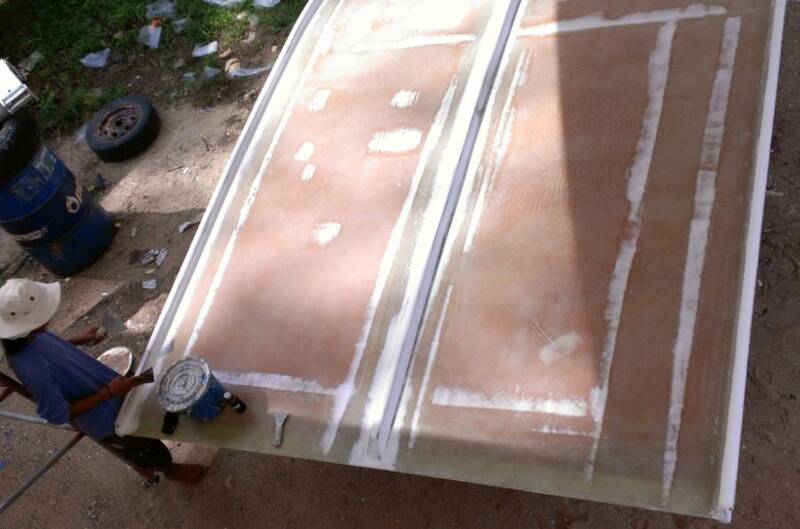 Nut and Sue put in time hand‑sanding the fiberglass edges of the targa bar. This will be one of the first areas to get the new "Ocelot‑white" gelcoat next week, so we need to get it all ready. Chai attacked the big, flat areas of the targa‑bar with the dancing sander. The flat areas will hopefully be left without filler, but the edges will need some filler to give them a nice rounded look once again. Hoau finished gluing down the new plywood (epoxy painted) supports for the salon floor, then moved to the heads on starboard side. He found a couple more wet and de‑laminating floor supports on starboard, so he attended to those quickly. 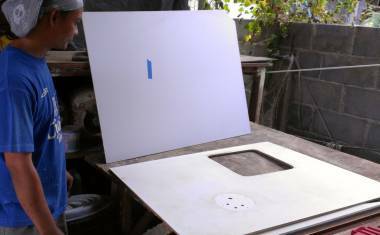 He has also located white plastic boards that we can use to replace the plywood that is currently in the bathrooms - in the headliner and under the door and up the corners. Given that we can shower in the heads (though we rarely do) it's silly to have plywood in there where it can get wet all the time. We got a new worker yesterday, but just met him today. Jack is off one of E‑U's other teams, and we're glad to have him aboard. He has dedicated his time to finishing the jobs Pooton started a couple weeks ago. 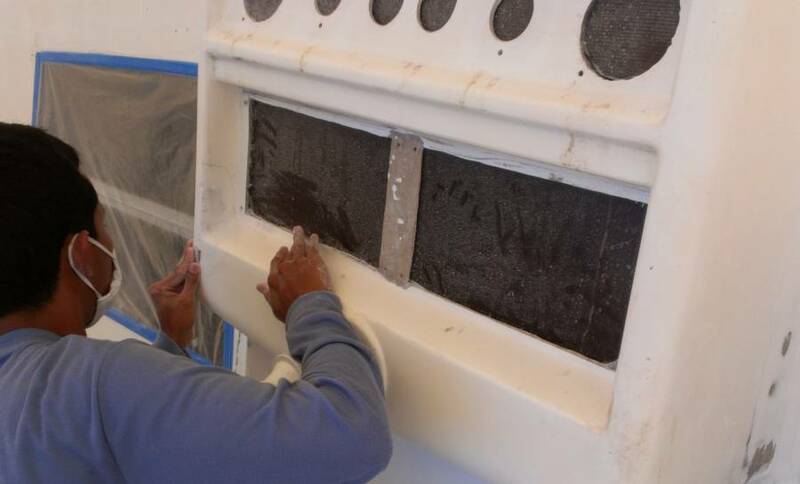 He not only finished sanding the louvers, but he marked in pencil what areas need polyester filling and fixing. Good man. It's always nice to have a visual reminder of small jobs that need doing. We expect he will carry these projects through. With only a half‑day at the yard, Sue and Jon didn't get a whole lot done. Jon spent most of his time adjusting and working the guy lines for our numerous tarps and tent supports. Unfortunately, the upwind (northeast) side of the tent is towards a large open area that the yard folks occasionally use. Consequently they don't want our guy lines stuck into the ground out there. But that's exactly where we need support if we're to keep the tent up in some of the squalls that we've had. Jon had to get creative with other lines attached to Ocelot herself, and to big drums of concrete or water. Sue spent much of the day assessing the deck gelcoat situation. Although Baw put a lot of time into marking off the nonskid areas and masking those parts of the deck, it was work that will need to be redone. 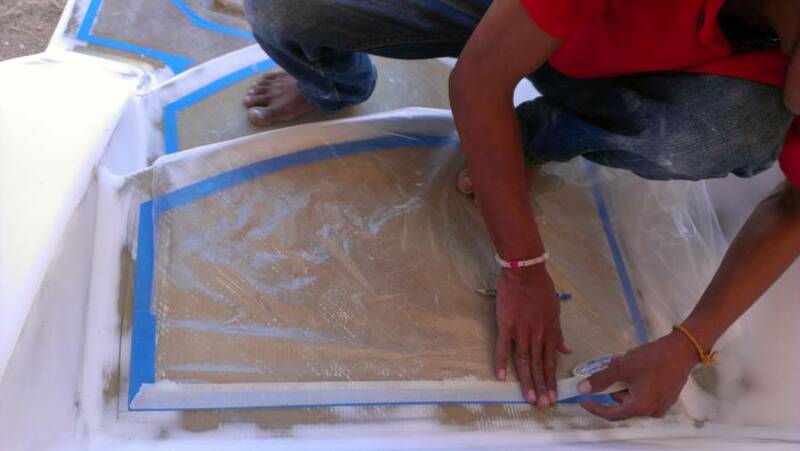 Part of our contract with AME Marine and Mike's team is to lay out the nonskid to be functional and symmetrical, with the right size corner radius to make it easy for them to cut. We were glad to see that Baw put down a good estimate of the where the "gutters" will be along the deck coaming. But the guys will have to sand back the sharp edge where the Thai gelcoat ends. We can't have doubly‑thick gelcoat edges up against the nonskid. Hot and sunny, with enough breeze to carry the gelcoat spray aw..wa...yyyy! We hear of snow in the air in the northern climes, and here in Phuket today we had white in the air as well. White gelcoat that is! We had missed Baw's spraying of gelcoat on the deck over Christmas, so it was fun to be there for another spraying event today. Baw spent much of the morning prepping the port sugar‑scoop with tape and plastic to mask off toe‑rail, stanchions, targa bar, etc. After lunch we were witness to a glorious spraying of white, white, white! Not the final stuff, but still fun. We now have a glorious shiny white sugar‑scoop. The shiny surface lets Baw see where it needs bits of filler and touching up. Nut prepped the area near the compass, up on the cabin top. We hope the next area to be gelcoated will be the companionway door frame and surrounds, where Nut has worked so hard for the last 2 weeks! 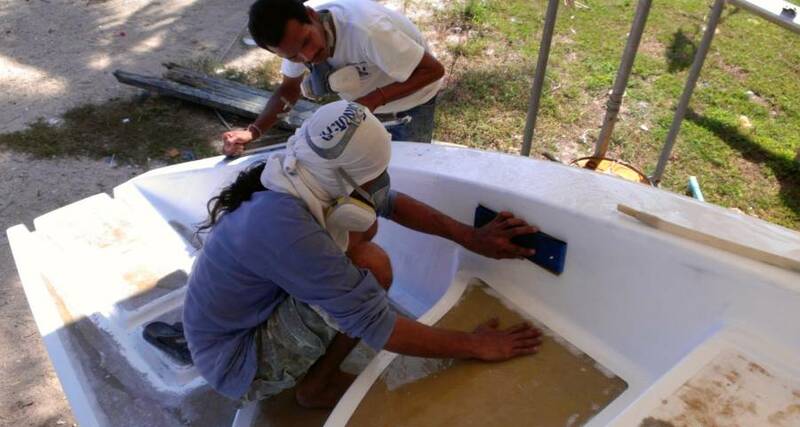 Bank moved around from cabin top to vertical walls, sanding and touching up areas that got gelcoated on the 25th. 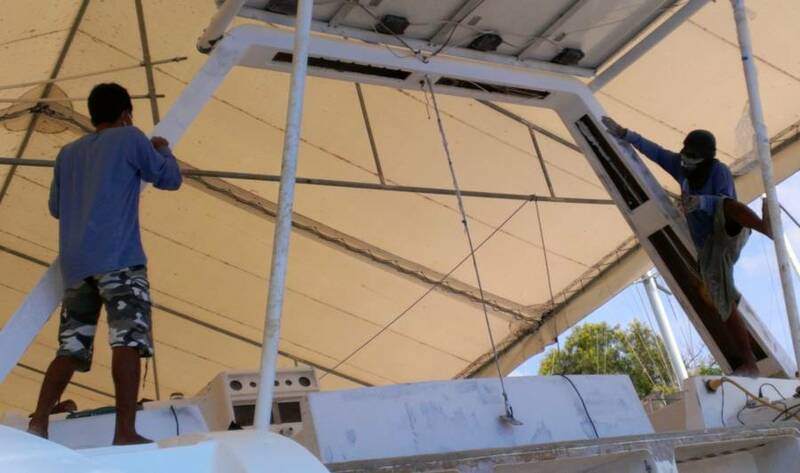 By using just gelcoat, without micro‑balloons, they can fill only very shallow indents, but the good part is that there's no way they can put on too much, and thereby waste materials by having to sand off 90%. 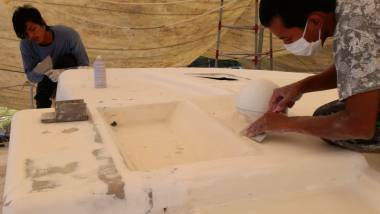 Lek also worked on the cabin top and the deck coamings where Baw had gelcoated on Tuesday. At the end of the day he was Baw's #1 assistant for the gelcoating, keeping the mixture coming as Baw needed it, and attending to the big petrol‑powered air compressor that drives the spray gun. Jack was doing good things down under Ocelot. He put tiny amounts of filler on the top of the bimini, just the way we asked him to. 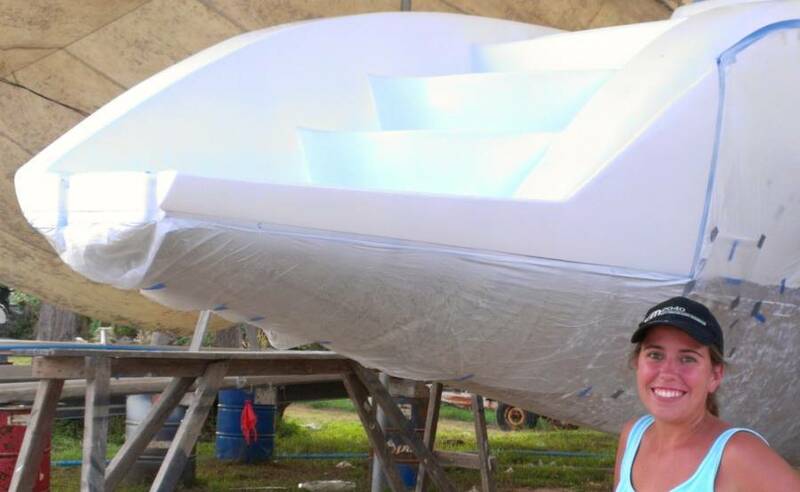 Once these get smoothed down the bimini should be ready for "real" gelcoat next week. Jack was also working on the louvers for our side windows, repairing dings in our chain‑locker hatches, and other small fiddly projects. Jack obviously works well, listens well, and needs little direction. Chai focused on the targa‑bar, which we had said was top priority as it's to get its final gelcoat next Wednesday. He went a bit overboard with the filler, really slabbing it on, letting it set, and then sanding it off. It seems to be a rare worker who understands that the request for "nit noi" (very little) filler really means put on a series of thin layers, not a big splat all at once. 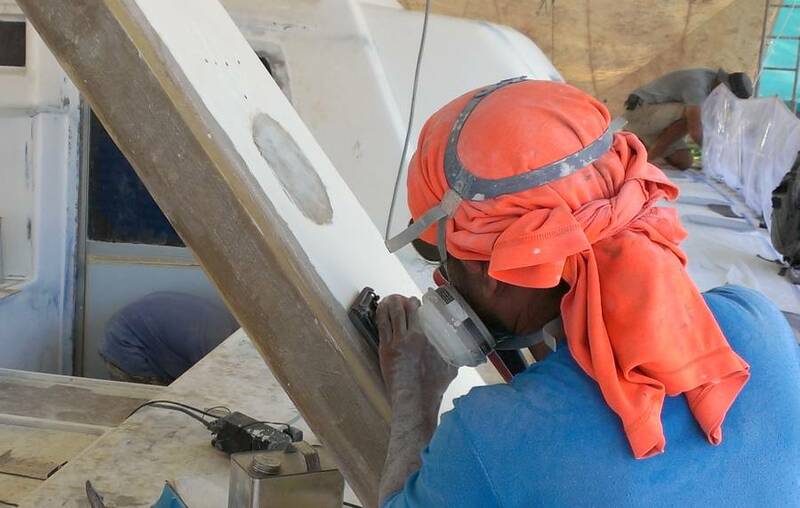 Anyway, the filler is on the targa‑bar, and Chai has begun sanding it off to try and give us a nice rounded forward edge, and squared off aft edge. Baw and Chai have a bit of friendly competition going with the sugar‑scoops. 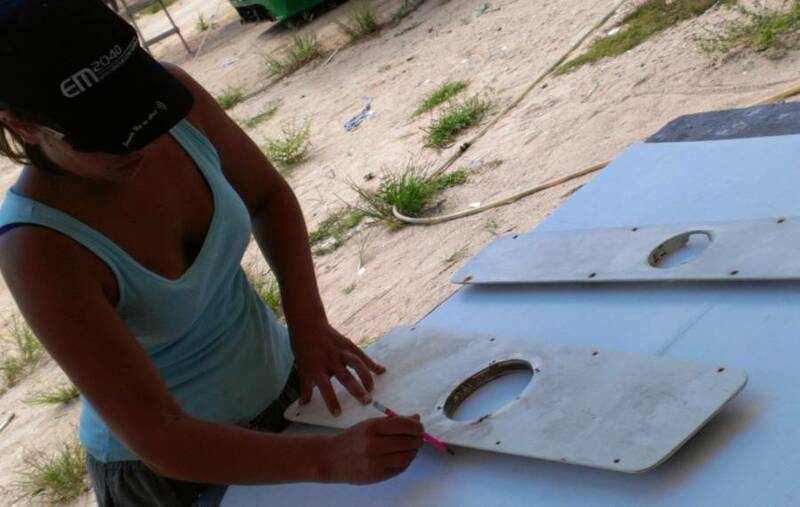 Just before Baw sprayed, Amanda pointed out a strange upturned angle to the aft‑most edge of the port sugar‑scoop wall. Baw dropped the gelcoat mixing and spent 10 minutes sanding the filler to a better shape! Chai saw this and chortled, and there was some good‑natured razzing going on. Of course, Baw can still point out that he has finished his side first, and now Chai will have to copy his work to make the two sugar‑scoops look the same! To that end, Chai added more filler to the flat spot on the outside of the starboard sugar‑scoop. Houa with an old bathroom headliner (down) & new plastic "wood"
Houa arrived a bit late as he had met one of the guys with a pickup truck at a shop in town called Kittipan, which has a strange assortment of boat and building things. What he brought was 3 big sheets of "Siam Plastiboard". 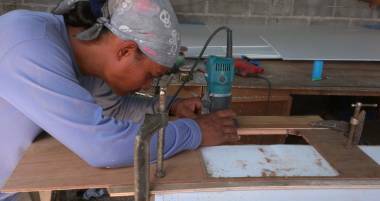 It's a plastic conglomerate board that is impervious to water, can be cut, sanded, glued, and painted, and seems like just what we're looking for to replace the plywood (wet and unhappy!) in our bathrooms. He got 3/8" (10mm) for the vertical wall sections, and ¼" (6mm) for the headliner. He used the old headliners as templates and got some new ones cut out. Jon was off on Scooter until 2:30pm. His goal: to find new stainless steel handle/pulls for the battery hatch and 2 engine hatches; foam, stainless steel staples and a staple‑gun for the headliners; thin rubber matting to go above the floor supports; and gasket material for our outside hatches. He couldn't find handle/pulls, but we can have our old ones re‑plated with chrome for much cheaper than buying new, and they should look great afterwards. Maybe they'll last another 18 years! Thin foam to go under the vinyl of the headliners is no problem. Stainless steel staples (6,000 for $20) can only be bought for air powered staplers, but a Skil air stapler is only $45 and we already have a cute little electric air compressor (left over from Golf). Jon eventually found rubber sheeting and good thick gasket material at G.C. Huat, a strange and tiny hardware store in Phuket Town with an amazing array of stuff and a proprietress who speaks excellent English. Jon returned mid‑afternoon, followed closely by Mike from AME Marine for his weekly assessment and consultation. Today it was much needed as Baw is zooming ahead with his "under‑layer" of Thai gelcoat, and we wanted to be sure he was doing it well, as Mike will be spraying our more expensive gelcoat right on top of Baw's. Mike's visit prompted long talks about the width of the "gutters" (the smooth trim around the nonskid patches on deck) and what order to do the topside preparation for gelcoat. Sue played Project Manager once again, struggling with which things to comment on or change, vs what we'll just have to live with. We've learned that we have to pick our fights, not comment on everything. We've also decided that running herd on 8 Thai workers to akin to herding 8 cats! End of the week? End of the week? Oh, darn. Not yet. It's been a short week for us, what with Christmas days off. But on Ocelot the pace continues unabated. Sue arrived early (again) to find a second new worker of the week -- Yoong. He and Jack are the new arrivals from E‑U's premier team, and we're so glad to have them! Yoong, with his head wrapped in an old T‑shirt to ward off the dust, spent the day on the targa‑bar. He sanded down the filler that had been splabbed on yesterday by Chai, then carefully reworked the shapes of the flat aft face and the rounded forward face. In one day, he got them both to about 90%. Just a bit of "nit noi" filler on tomorrow, and the targa‑bar will be good to go. 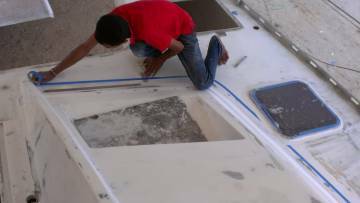 Chai worked on the engine hatch coaming on starboard side, for which Sue introduced him to the chisel which worked wonders at getting out the over‑flowed epoxy from other jobs (at the expense of Jon's chisel's edge). 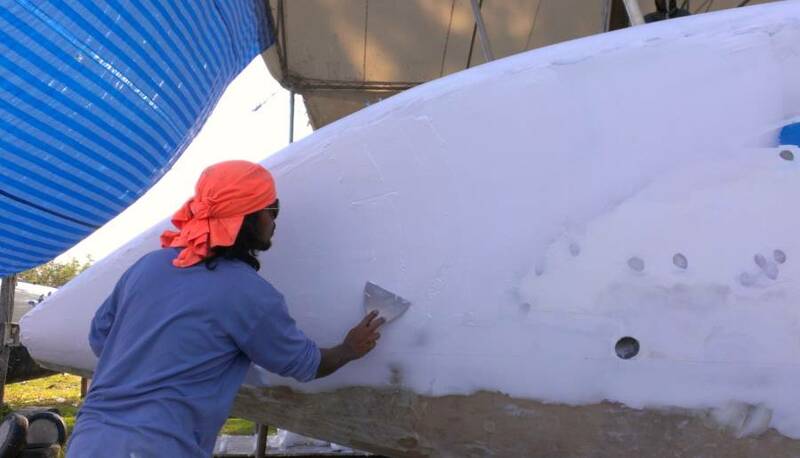 When Chai asked if he could spray gelcoat on the starboard hull tomorrow, we took a moment to inspect the shape of the hull with him. Hmmm... Still a bit flat in parts, and with a definite line that shows where the old sugar‑scoops had ended. So we pointed this out to Chai, and with his characteristic good nature, he dove right in, mixing new polyester filler and working it onto the flat areas to give them a bit more bulge. His plan to spray Thai gelcoat tomorrow may be put off for a day, but we can't add any bulge once the gelcoat is on, so it's now or never. Nut assisted Chai in his afternoon filler adventures on the hull. He was also a lead in setting up the spraying of more mono wax onto the uncured gelcoat in the port ladder grooves. We found out after lunch that the gelcoat around the grooves hadn't hardened, and while Sue was having a min‑fit about it (quietly! ), Chai, Hoau and Nut inspected the situation and declared, "No promphem, Madam! We spray mono wax!" Turns out Nut has owned kayaks for years and is quite familiar with making gelcoat repairs. Perhaps Baw forgot the mono wax in one of his spray batches yesterday. We don't know, as he wasn't at work today. But the guys did the wax spray, and on the places that didn't kick, they proceeded to acetone and scrape it off. Sigh. Two steps forward, one back. Houa made good progress on the headliners for the heads. He got all 4 top pieces cut, with the rounded square holes for the hatches. He also started working on the angled pieces which have to be carefully tapered to fit the slanted ceiling. 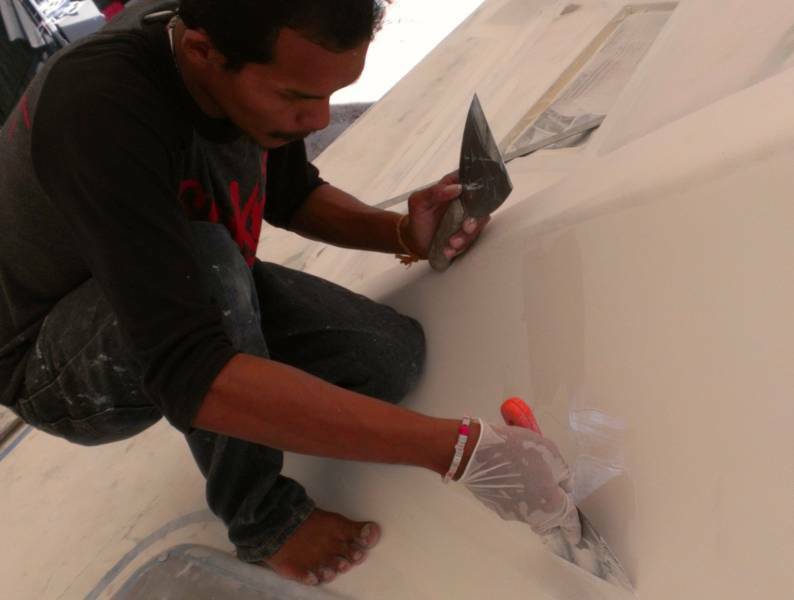 Lek and Bank were the foredeck team, sanding back the gelcoat that Baw had sprayed on Christmas Day. It's really nice to have workers who are willing to take direction. Lek was totally cool with being asked to sand up under the eyebrow on starboard, an area that was gelcoated months ago, and polished, and needs to be roughed up for re‑gelcoating with the new color. The only down side to the pre‑gelcoating in Thai white, then sanding to make the curves beautiful and fair, is that in sanding back the gelcoat to a rough enough state to re‑coat, the guys might just sand away the new carefully made curves. In other words, they might just UN‑do what they've spent a few days (and our money) doing. Hmmm. The alternative is to be able to see/feel the anomalies in the shapes and curves with your eyes/fingers on a non‑shiny surface, and despite the inevitable color variations. Jack carried on with his project of sanding and putting filler on the auxiliary pieces like the louvers and hatch covers. He works really well, and always has a smile, even when nosy Madam Sue gets in there to examine the details! He is also one of the workers who is very fond of Turtle, our "adopted" calico boatyard cat, so it's fun to see him play with her. Amanda attacked details on the mast that had not yet been introduced to her polisher. This was fiddly work, involving getting the polishing pad around the tangs and aluminum fittings, but she did a great job. 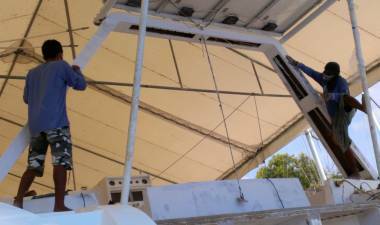 We hope to be able to find a dust‑free day over New Year's to get more Nyalic on the mast! Jon ran errands for the boat in the morning, including paying off our bill to Luck Engineering for all our stainless steel jobs. The quality of Luck's work is excellent - we can't recommend them enough. Costs (in 2012) are per the table at right. Sue got herself covered in dust when she took over the engine hatch job from Chai. She got the rims all sanded and smoothed into a rounded shape so that if (notice we didn't say when) Jon falls in again, he won't get hurt on the sharp edges. Since it was payday, and in fact the payday before a 3‑4 day holiday, we had the full contingent of workers! Jon ran more errands for the boat, and held down the fort while Sue and Amanda took a mental vacation at the coffee shop for an hour in the afternoon. Houa was finishing up the headliners for the heads, and they're going to look great! All nice and white and plastic(!) so no more delaminating plywood! Yay! This board can apparently be sanded and then painted, but the natural white looks quite nice. The downside is that it scratches easily, so we hope we don't have to scrub it very often. 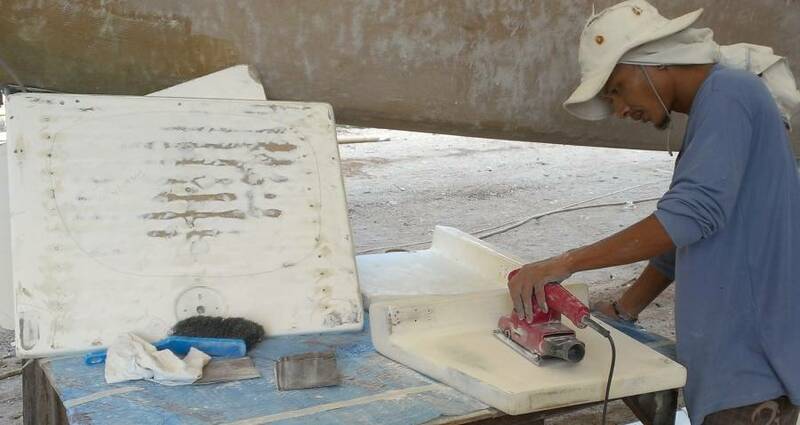 Under Ocelot's bows, Jack put the final sanding touches on the bimini top so it's basically ready for Mike to spray it with gelcoat next week. He also laid out all the projects of the hatches and louvers to be done, all neatly stacked and labeled. Gotta love it. Bank worked on the cabin top with 120 grit sandpaper on the newly sprayed Thai gelcoat. It's nice to see them using finer sandpaper. You never realize how many little wiggles and curves and nooks and crannies a sailboat deck has until you try and sand each and every one! We're getting there. Baw was back today and did his wet sanding magic on port sugar‑scoop and steps. Lek was the back‑up man who got to "play" in the water with Baw. It was amazing to see the water running down over the shiny white gelcoat. As beautiful as it is, we're glad we've chosen to have an off‑white for our final exterior color. It's going to be very bright! Baw helped consult on the starboard side sugar‑scoop which Chai has been working on. 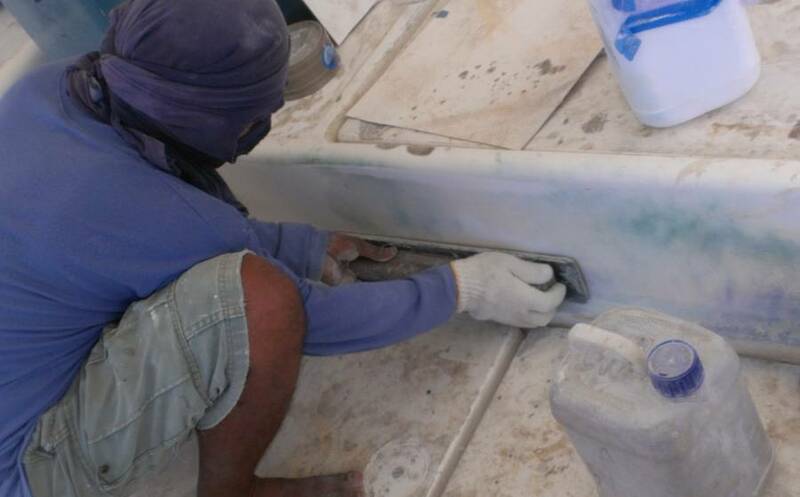 We think they are very nearly there, in terms of getting rid of the flat surface on our otherwise rounded hull. Nut was the "dust man" for Chai, spending more time than anyone with the long‑board and facemask, creating the new shape. Yoong finished the targa bar work, including re‑taping the big stainless‑steel foot bracket on each side. Then he approached Sue, saying , "Madam?" and he pointed to the walls and trim of the cockpit. Yeeesss! Love that initiative. So now the cockpit is beginning to looks all cleaned up and ready for gelcoat! Up to this point, the main areas that have gotten attention are those that were re‑built when we had to take out old balsa. It seems that most of the re‑shaped areas are now finished and it's time to move onto the more mundane stuff, like the "original boat" and its very worn‑down gelcoat. We had the fun of seeing Max, one of our favorite workers, today when he stopped by to visit. He is now driving long distance 22‑wheel trucks for a living. He looked great, and parenthood seems to agree with him. We gave Max and all our guys Ocelot Refit Team, Phuket Thailand T‑shirts as holiday gifts, and they were quite happy! The guys take a 3‑day holiday now for New Years, and will be back on the boat on January 2. At least that's what they're aiming for. Party Party Party! Happy New Year, all! And by the way, if anyone worries about more End of the World events, just remember that here in Thailand it's already 2555, and soon to be 2556!